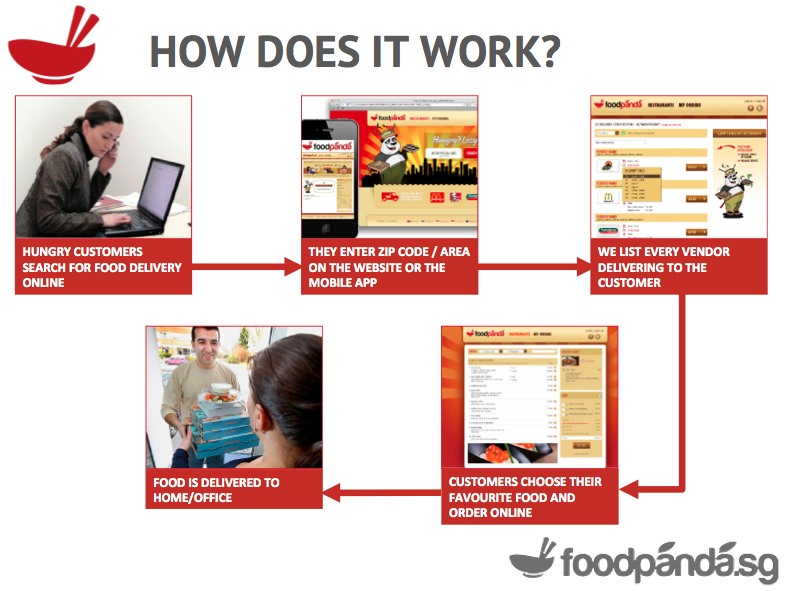 Food Delivery Services – HungryDelivery, Room Service Deliveries or FoodPanda? I’m not sure about you but the only 2 things that come to mind for me when someone talks about food delivery is fast food and tingkats, a tiered chinese lunchbox that can have 3 to 4 trays stacked on top of one another. I would say food deliveries are definitely less prevalent in Singapore as compared to other developed countries because of the dense urbanization here. One will find no trouble locating a coffeeshop near a residential estate and that has probably stifled the growth of the local food delivery sector. Increasingly however, we have started to see a viable market for such a service, as more and more Singaporean families are emerging with 2 working parents who have no time nor knowledge on how to cook and are just too busy or lazy to trudge down to their nearby coffee shop to da pao food back after a hard day at work. In addition, the affluent generation of today is no longer content with simple tingkats day after day, placing more emphasis on variety (of cuisines) and quality. A few entrepreneurs who noticed this growing trend decided to capitalize on this, giving rise to ventures such as FoodPanda.sg, HungryDelivery.com (from the people who brought you hungrygowhere) and RoomServiceDeliveries.com just to name a few. I’m not going to feedback on any of them, since I have never used their services but will attempt to compare their modus operandi and pricing strategy. I’m estimating they have about 40 partner restaurants (including the likes of Dallas Restaurant, Timbre and Red House Seafood Restaurant). You have to call their hotline to place orders and a severe downside is that the hotline only operates during lunch and dinner hours between 11am-2.30pm, 6pm-9.30pm. Navigating through their website is relatively easy as their partner restaurants have been categorized into the different cuisines types and price ranges which can then be selected by users. As for the pricing strategy, HungryDelivery implements a 10% survival charge (think of it as service charge), in addition to delivery charges which are divided into 5 tiers from $4-$14, depending on the distance between the restaurant and the delivery address. On their website, users can type in the postal code of where they want the food delivered, to search for the nearest partner restaurants to minimize on delivery charges. 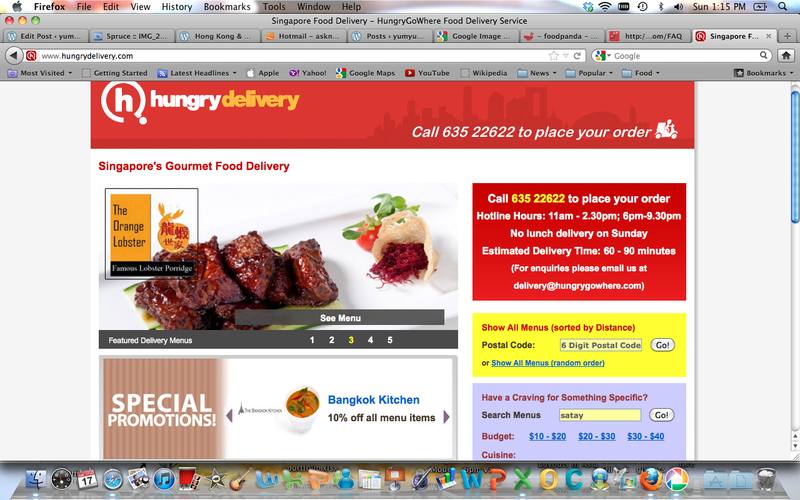 For HungryDelivery, the minimum order is $25 and orders below $40 are subject to an additional $5 surcharge. Confused yet? Let’s break it down into an example. Let’s say I called in to purchase dinner for myself from Etna Italian Restaurant and Pizzeria (East Coast). The order comes up to $30. What I will pay is $30 + $3 (10% survival charge) + $4 (I stay in Kembangan, 2.3km away from Etna, so distance falls under tier 1, shortest distance of the 5 tiers) + $5 (surcharge for order under $40) = $42. They have approximately 60 restaurant partners (notable restaurants include Relish which serves gourmet burgers, Graze which serves Australian fare and Kha which offers Thai fine cuisine) and operates between 11am – 11pm. The minimum order is $25 and they charge a 10+7% service charge & GST, and delivery fee of between $10-$12. 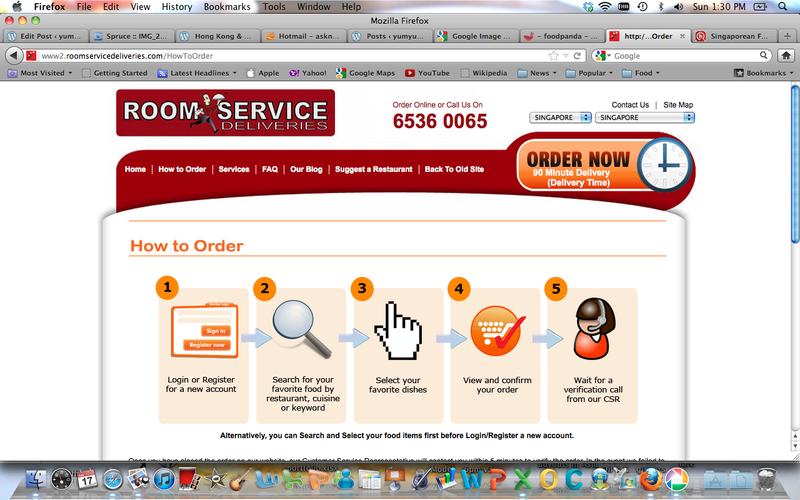 Unlike HungryDeliveries where you just have to call in to place an order, users of Room Service Deliveries will first have to create a new account or log in to their existing account on the site, place their orders online and wait till the customer service representative calls the user to verify the order. Slightly too much hassle if you ask me, even if it does minimize any ordering errors due to the feedback mechanism (thr the call back) in place. I met up their team over dinner recently and they shared with me some of their plans for the future. From what I see, FoodPanda is currently leading the race to become Singapore’s dominant food delivery service provider as it already has more than 130 restaurant partners locally. They seem to live by the adage “go big or go home”, bolstering their network to several other Asian countries such as Malaysia, Thailand, Indonesia, India, Taiwan, Columbia and Vietnam. 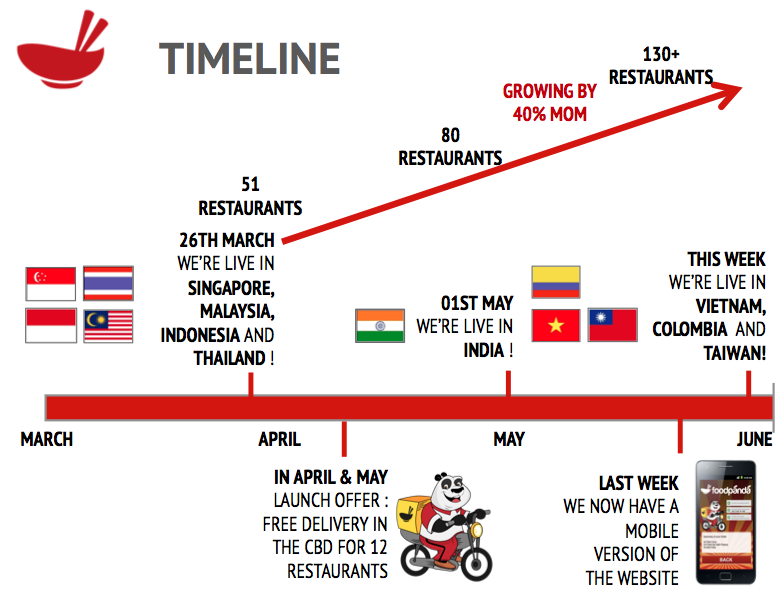 Personally, I find FoodPanda’s website layout and ordering process the most user-friendly compared to the other 2 food delivery website previously mentioned. Once a user has entered the postal code of the intended delivery address, partner restaurants that offer food delivery to that address will be shortlisted and variables such as the delivery fees, delivery time required and minimum order will be calculated across these different restaurants and shown conspicuously on the list of shortlisted restaurants. From the list of shortlisted restaurants, you can also filter them down based on your preferred cuisine preference and budget, which allows users to narrow down their search for an ideal restaurant. If you are interested in trying out FoodPanda’s delivery services, I have 50 free food delivery vouchers to give out for the following restaurants: Bergs, Baja Fresh Mexican Grill, Kraze, Rock & Ash, Mosi, Aglio Olio, Grand Salads, Men-Tei, Rotisserie, Graze and Kha. 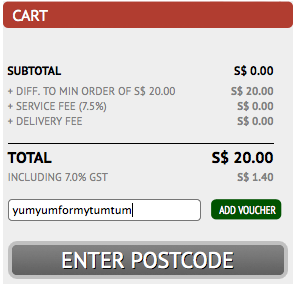 You just have to type yumyumformytumtum when placing your order to enjoy the free delivery (illustration on image below). Greattt it is.With the reference of this blog you have described your complete website very properly..It would be helpful for the people to access the site..And it is designed very effectivelyyy.!!!! !….I like it very much…@..@..@. 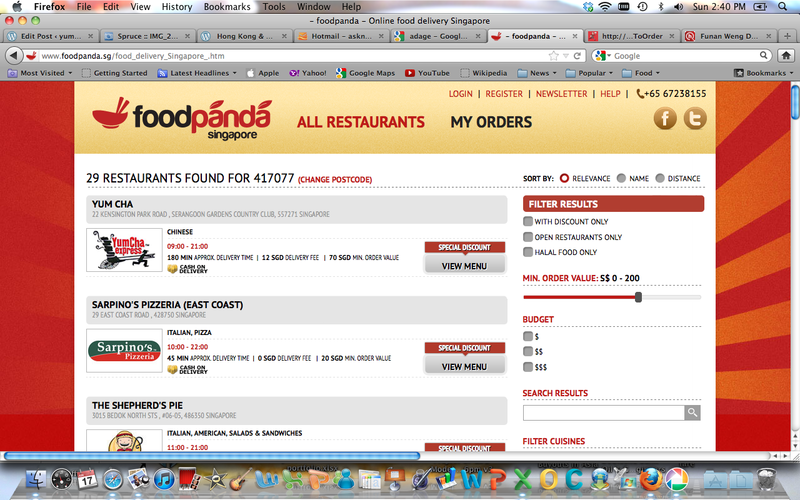 Food panda is best for online ordering. Good look as well as user friendly navigation. easy to find food delivery services nearby. Hello, You’ve got completed an unbelievable task. I am going to absolutely stumbleupon the idea and for my own piece recommend to help my girlfriends. Most likely they shall be benefited from this web site.